What are Hip Muscle Strains? A strain is a tear in the muscle fibers caused by a fall or direct blow to the muscle, overstretching and overuse. Muscle strains often occur in the hip region whenever a muscle contracts suddenly from its stretched position. It can be mild, moderate or severe depending on the level of injury. The chances of having a hip muscle strain is higher if you have had a previous injury in the area or if there is no warm-up before exercising. The most common symptom of hip strain is pain and swelling in the area of injury. Pain may worsen when using the injured muscle and the strength in the muscle may also decrease. Apart from a physical examination of your hip and leg, your doctor may order an X-ray to rule out a stress fracture of the hip and to confirm the diagnosis. Anti-inflammatory medications may also be prescribed to reduce swelling and pain. In the initial two days, your doctor may recommend application of heat to the area using hot soaks or heating pads. It is beneficial to be away from activities that caused the strain for 2 weeks. During this period, simple stretching and strengthening exercises can be done to regain muscle strength. 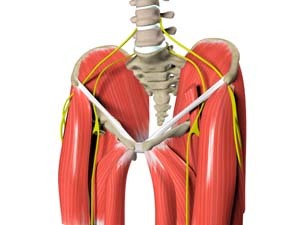 You can practice certain techniques to avoid straining the muscles around your hip. Stretching your muscles before starting any exercise or sport activity significantly reduces your risk. Also, remember to stretch the muscles slowly and hold the stretch for some time instead of making many rapid stretches. Warm up every time before you stretch. Participate in a conditioning program to keep your muscles flexible and fit and use appropriate protective gear for the sports activity.